It is magic through transparency. The music of Hans Abrahamsen (b. 1952), dark yet alluringly innocent, exhibits a pure, strong naïveté that opens up into a genuine magical world of both the bright and the sombre kind. Performing two of his early works – Six Pieces for horn trio and his first string quartet, 10 Preludes – Ensemble MidtVest brings out Abrahamsen’s characteristic clear, precise tone. The same clarity inhabits his arrangements of Erik Satie’s Trois Gymnopédies and Carl Nielsen’s Fantasy Pieces, exploring and evoking the original works in a new, unmistakably Abrahamsenesque way. 1. Serenade. Adagio sostenuto 3:12 4,80 kr. 2. Arabesque. Dolce ma poco nervoso 1:54 4,80 kr. 3. Blues. Andante malinconico 1:44 4,80 kr. 4. Marcia funebre. Adagio assai 3:40 4,80 kr. 5. Scherzo misterioso. Presto – Estatico (sempre presto) 2:20 4,80 kr. 6. For the Children 1:32 4,80 kr. No. 1, Lent et douloureux 3:50 4,80 kr. No. 2, Lent et triste 2:53 4,80 kr. No. 3, Lent et grave 2:30 4,80 kr. I. Romanze. Andante con duolo 3:27 4,80 kr. II. Humoresque. Allegretto scherzando 2:38 4,80 kr. The music on this CD extends, with the two original compositions, over ten years in Hans Abrahamsen’s career, during which there is striking musical development and a refinement of the musical expression. The two arrangements were written some years afterwards, when there were longer and longer intervals between the works, preceding the onset of an almost ten-year break in Abrahamsen’s activities as a composer. 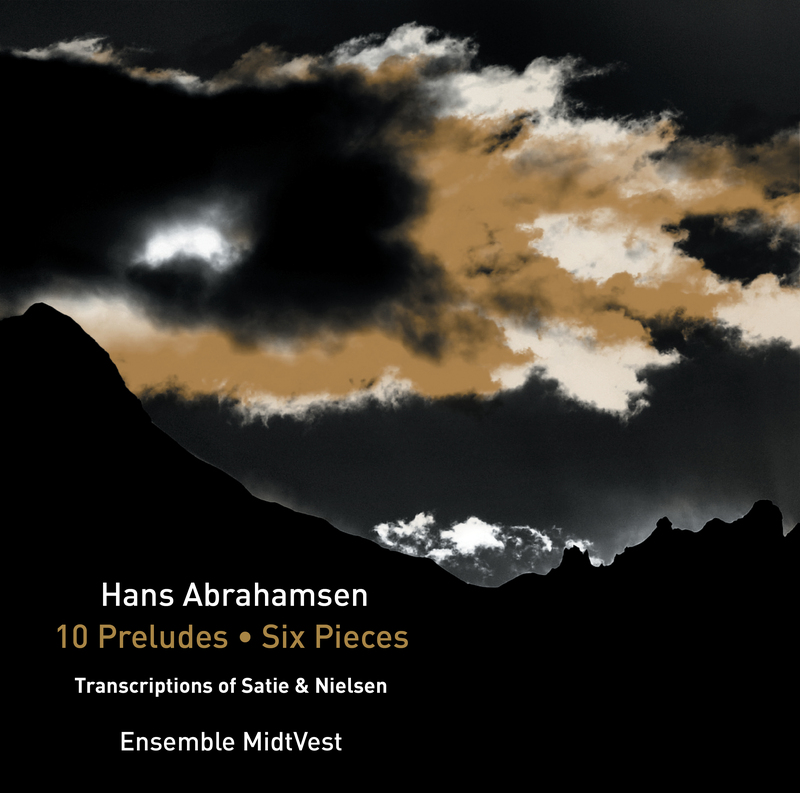 In those years in the course of the 1990s when Abrahamsen himself did not complete works, he wrote a number of arrangements of other composers’ works which – like the two arrangements on this CD – are unmistakably Abrahamsenesque in the transparency of the sound, but which to an equal degree deepen, explore and evoke the original work in a new way. Once the music began to flow again from Hans Abrahamsen after some years, he persisted his fascination with the simple in the course of the early 2000s, and to the magical he added a more generous musical pleasure in storytelling which was manifested for example in the sombre Four Pieces for orchestra from 2004, the sparkling ensemble work Schnee from 2008 and the subtle, strong solo work for accordion, Air, from 2006; polar opposites in the size of the ensemble, but musically these extremes are all examples of the assurance and originality of Abrahamsen’s voice as a composer. Hans Abrahamsen’s music exhibits a pure, strong naïveté that opens up into a genuine magical world of both the bright and the sombre kind. The music never becomes either/or or black-and-white, but moves between stages, focuses on flashes of light, and rests in the darkness. This mood is not far from the magical music of his mentor György Ligeti. But Abraham­sen is also a child of the Danish New Simplicity and, inspired by among others Pelle Gudmundsen-Holmgreen and Ole Buck, he concentrated his musical expression and developed the precise, clear tone that is evident, for example, in his first string quartet 10 Preludes. These two sides, the magical and the simple, are fruitful opposite poles in many of the composer’s works all the way up to the song cycle let me tell you from 2013, which has seen quite unprecedented success in the course of 2015 and 2016, when the work itself and the recording by the soprano Barbara Hannigan have won a succession of prizes including the prestigious Grawemeyer Award, the Nordic Council’s Music Prize and a Gramophone Award. Up to 2019 Hans Abrahamsen will be working on his first opera. The sequence of the six pieces was also changed between the piano studies and the horn trio. The horn trio begins with the quiet Serenade, which is like a fara­way echo of Romantic tones. But it is as if the whole work is drawn down like light deflected by the force of gravity. It is the fourth movement’s black hole of stasis, darkness and weight that strips the light out of the first three movements, so that the second movement, Arabesque, despite quivering restlessness and agitation, is dark in its expression, and the lopsidedly dancing Blues, the third movement, slowly comes to a halt. Then comes the fourth movement, the undisputed atmospheric centre of gravity. ‘Funeral march’, Marcia funebre, is the title; the mourners at this funeral can hardly move. In the midst of the darkness and silence come powerful, stark eruptions that bring no light, only put the darkness in relief. Marcia funebre is also the longest movement of the work. There is a liberating journey through the mysterious scherzo of the fifth move­ment – Scherzo misterioso – to For the Children, which with a pure, innocent openness concludes the work, comforting and possibly recognizing that the darkness may well be contained within the innocence. This form, with the black centre of grav­­ity in the middle of the work and the innocent and perhaps even expressionless ending, can also be found in the older work 10 Preludes for string quartet, and one can perhaps even draw parallels to a much later work like let me tell you from 2013. Six Pieces was commissioned for a concert on Danish radio in 1984, in which Ligeti’s and Brahms’ horn trios were also to be performed by the hornist Poul Erik Vilsbæk, the violinist Anton Kontra and the pianist Bohumila Jedlicˇková. In 1988 a small group of musicians from the Aarhus Symphony Orchestra were on a concert trip to Karen Blixen’s house in Kenya. The oboist Sven Kruse travelled with some of his string-player colleagues, and they were to perform among other works Mozart’s oboe quartet. They also wanted to play Danish music on this occasion, and the choice fell on music by Hans Abrahamsen and his first string quartet 10 Preludes. In addition they asked Abrahamsen to arrange Carl Nielsen’s Fantasy Pieces op. 2, which was originally for oboe and piano, and the concert programme for Karen Blixen’s house in Kenya was also to include an arrangement for oboe and string quartet of Erik Satie’s well-known Trois Gymnopédies. In Abrahamsen’s version these three well-loved piano pieces retain their alluring mixture of amenable gentleness and distant mystique. They are given some depth, and perhaps the mystique becomes slightly more lush and melancholy? Mozart wrote an oboe quartet with the ensemble oboe, violin, viola and cello, and this is the ensemble Hans Abrahamsen uses in his arrangement of Carl Nielsen’s Fantasy Pieces. Originally Nielsen composed the music for oboe and piano in 1889, and it is melodic, sparkling music. The first fantasy piece has the title Romance and the instruction Andante con duolo, ‘with pain’. The fantasy pieces are works of the composer’s youth, and the effervescent Humoresque, ­Allegretto scherzando – ‘joking’ – sounds very youthful. The piece has a humour and imper­tinence that Nielsen allowed to shine through in various forms throughout his composing career. Hans Abrahamsen’s arrangement, as always, is not simply a reproduction of the original music for other instruments; it is an exploration, an unfolding and perhaps also a comment, although the comment is always given with humility towards the original work and the composer. Abrahamsen’s own ear for instruments and their sounds leaves its mark, so each of these ­arrangements functions as a greeting from the future. As in the later Six Pieces for horn trio (1984), for example, there is a centre of gravity, a zero point as the composer himself calls it, in the middle of the string quar­tet, in this case the fifth prelude, which ticks slowly along and in the midst of its measuring of time makes time come to a halt. And as in the later trio too, the work closes with a moment of innocence, in 10 Preludes not a look back at the innocence of childhood, but perhaps at that of the past. Yet in their expression the preludes, despite formal similarities, are a quite different work from the horn trio. At the beginning of the 1970s Abrahamsen was one of the young exponents of the New Simplicity, a striving to express what was to be expressed with the fewest possible musical components; a tightening of mate­rials and tools so that what remains is simple, clear and open. Gone were the (emotio­nally) charged musical figures and the urge to complexity of earlier times. 10 Preludes is at many points the epitome of New Simplicity, but it is also a youthfully sparkling variation on that current and, as the composer himself has also noted, this work contains material to which he has returned later with great profit. So it is for example with the eighth prelude’s idea with three notes that are repeated and moved around. The idea is a building block for the much later work Schnee from 2008. The first string quartet was also recomposed in 2010 for orchestra by Abrahamsen him­self, in yet another example of his going back to earlier works and shedding new light on them. The ten compact movements in the string quartet are full of ideas, moods and musical material trimmed right down to the essentials. Recorded in the DXD format (Digital eXtreme Definition), 352.8 kHz / 32bit. Pyramix DAW system with Tango Controller.